Summer’s coming to a close. You’re coming back from vacation and there’s so much to do before the kids go back to school and you don’t even know where to start. That’s where we come in! Kids don’t always like to clean. Why would they when they could be enjoying the last days of summer; but did you know that they could have it both ways? 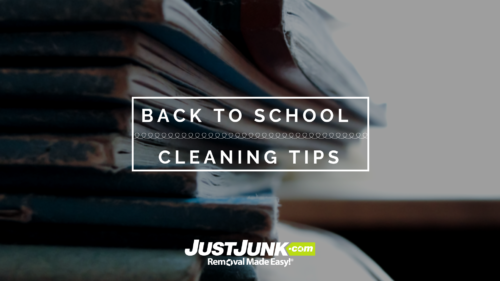 Here are 5 tips for the whole family to get things ready for back to school that are fun and will make the process go so much faster. As young as eighteen months, children can begin doing small tasks on a regular basis. This won’t result in them taking out the garbage, but they will begin understanding the layout of your home and understanding that packaging for certain snacks and other items go in the garbage when they are done using them. Older children are more used to routine, able to do things like sweep, take out garbage, dust, etc. They may take a little longer, may be more complex and require a little more heavy lifting, but making sure that the you assign them tasks that they’re capable of doing – with clear end goals – will give the more impatient kids an end in sight. There may be a lot to do, and enough people to do it all in one day, but you don’t want to exhaust your family with a huge session of binge-cleaning. Make lists of what needs to be done, who can do it and when, and consult with your kids in this phase. Making them more involved in the planning process, giving them agency in the process, leads to less confrontational cleaning sessions and a smoother operation. Sticking to a schedule that they helped make will give a stronger sense of accomplishment overall. It can be frustrating for anyone to complete all the tasks to then have more piled on top of them; but if you offer your kids an option and a benefit – like a trip to the movies or going out to their favourite restaurant – to breaking the schedule, you could finish up even faster! It’s all well and good to see a clean space as a reward for all their hard work, but where adults often see a job well done, your kids may not. Instill a sense of accomplishment for the whole family with mini-rewards for each individual task, whether that be screen-time, out-doors time or a small family break for a treat between tasks. Has one of your kids shown a liking for certain chores? Tailoring the chores to your kids’ preferences not only gets the job done but can also give them the sense that they’re listened to and appreciated, creating a great family environment for cleaning. Be attentive to their strengths and how they can make the process better, because it’s heading into fall, and no one REALLY wants to be cleaning during those last days of summer. You don’t want to pile all of the items randomly. Prepare a space that to put items that need to be donated or picked up by a junk service (like us!) that doesn’t invade their space so that between tasks they can retreat for a quick break and recharge in their own space without worry that they have to clean up again and again!